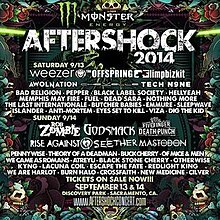 Aftershock Festival is an annual concert sponsored by Monster Energy held in Sacramento, California that features several rock and metal acts. Beginning in 2012, the festival expanded from a one-day concert to a two-day festival. In 2019, the festival expanded to three days. Tour poster for the 2017 Aftershock Festival. Line-up is yet to be announced for all three days. ^ "Aftershock 2017 Setlists". setlist.fm.